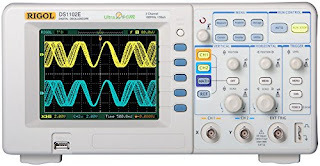 Oscilloscope Rigol 1102e is an exception when compared to the abundant opportunities that it provides to its economic price. This model Rigol DSO is one of the best-selling product in its category to 100 MHz and finds extensive application in research and development (R & D) wing, technical training, field engineering, electronics and electrical engineering laboratory, and more. Some of its features include a high depth of 100 MHz memory. complex mathematical calculations using FFT's, recording and playback functions, Roll mode, alternate triggering capabilities and adjust the trigger sensitivity. All these features and more comes with this powerful scope Rigol at budget prices. 0 Response to "100MHz Digital Oscilloscope -Rigol DS1102E. Electronic Circuit Design"